My friend Bryan and I had just finished having our auras read in Chinatown and were in pursuit of coffee to balance our chakras when we stumbled upon the Cheryl Hazan gallery in TriBeCa. There, we were greeted by a joyful red-headed gallerist named Hebe and an equally joyful show — Charade by the artist Kazumi Yoshida. 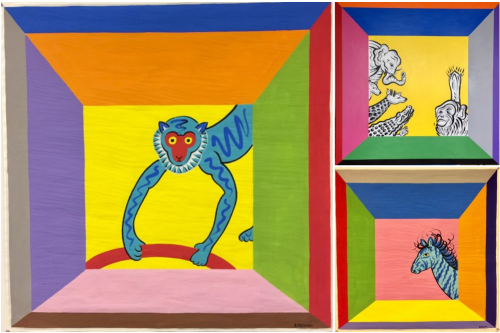 On the walls at the entrance of the Cheryl Hazan gallery hang Yoshida’s Menagerieseries: brightly colored animals – mischievous monkeys and nonchalant zebras – are accompanied by larger, calligraphic works playfully named variations on Roar. Many of the pieces in this series are done on 41 x 41 in. square paper with gouache, a type of thick watercolor that allows for more vibrancy in color than traditional watercolor. They seemingly pay homage to Yoshida’s own background in textile work and design – Hebe informed us that he has his own textile company, Clarence House, and has previously designed scarves for the famous fashion brand, Hermes. Bryan – with his emerald shirt and bright yellow sunnies – looked perfectly in place against the artist’s Barragan series, which consists of characteristically bright, primary colors painted on wooden boxes where thread is stretched across in various ways to manipulate the viewer’s perception of the pieces. Looking at them reminded me of the classical Greek story of Ariadne, the daughter of the king of Crete who helped free the hero Theseus from a labyrinth with a monstrous Minotaur by giving him a piece of string he could follow to freedom. If the intention of Kazumi Yoshida was to provide a Charade and a Charade is to be defined, as by dictionary.com, as an absurd pretense intended to create a pleasant or respectable appearance, Yoshida has succeeded in his venture. The exhibit is fun – the art show equivalent of those little children toys left on tables in pediatric waiting rooms…if those toys were suddenly huge and zoo-themed but also had knowledge of psychology classical Greek love stories. 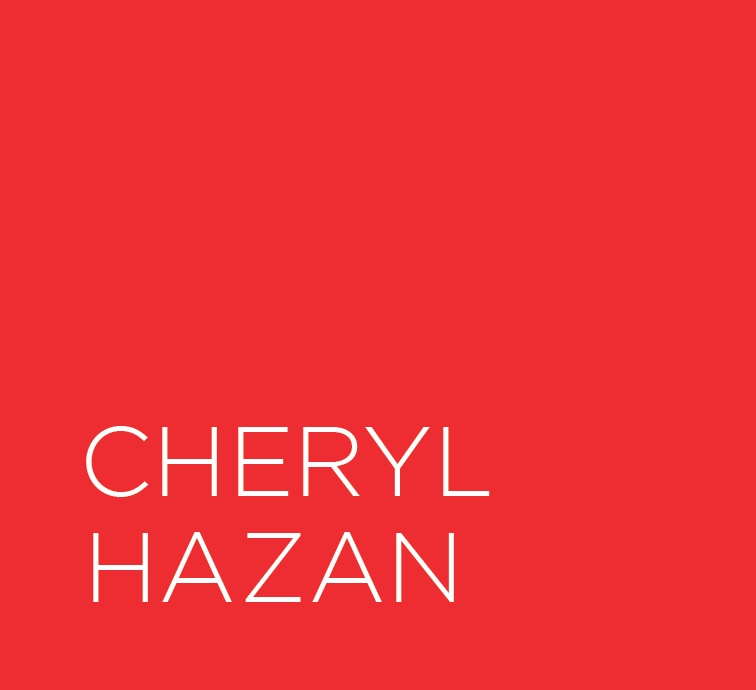 Cheryl Hazan Gallery is located at 35 N. Moore Street in New York City and is on view until August 19th!